What's sticking to my hull? Hull biofouling: a boater’s dreaded bane that requires necessary periodic elbow grease. Especially in marine water, the unwanted accumulation of microorganisms, algae and animals on wetted surfaces can be costly if not attended to regularly. For recreational or commercial boaters, the danger of transferring non-native species is added to the increase in fuel consumption and maintenance cost. The Navies of the world are not immune to this plague either. One study roughly calculated the cost of coating, cleaning and fouling on the United States Navy’s destroyers (class DDG-51) to reach $1 billion over 15 years! Whether one considers boat hulls, sensors, aquaculture facilities, pipes, offshore platforms, pilings - any unprotected solid surface will develop some form of marine growth when immersed in seawater. 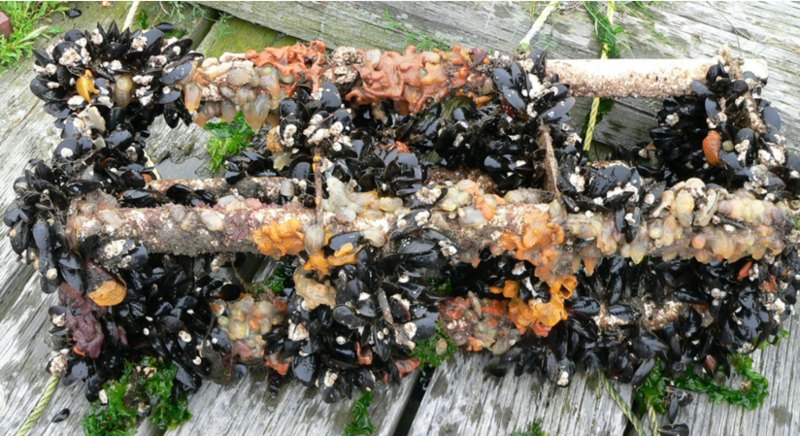 How exactly does biofouling happen? It all starts with a biofilm, a complex living microbial community embedded in a thin glue-like matrix. Within seconds to minutes of immersion in seawater, dissolved organic molecules stick to the surface and form a sort of “welcoming rug” for bacteria and other microorganisms in the water to settle on: this is the beginning of slime formation. This early sticky slime promotes further recruitment of organisms from the water and facilitates a strong adhesion. 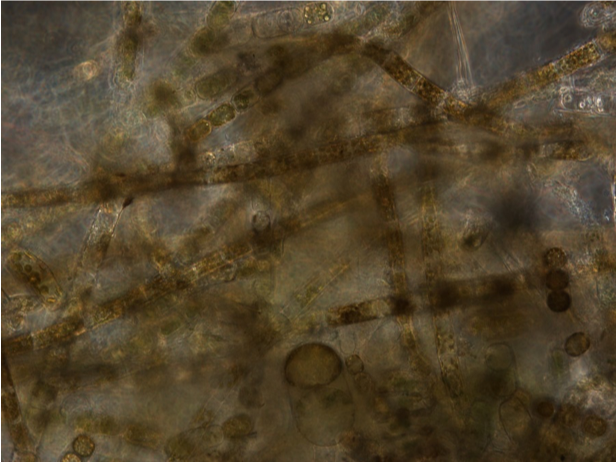 Although biofilms differ between environments (marine, freshwater, treated industrial wastewater, and even dental plaque), they all produce sticky compounds that eventually form a dynamic and complex 3-D matrix with microorganisms. With continued recruitment and growth, the biofilm thickens. If the surface is exposed to light, various algae (primarily diatoms and seaweed) intermingle, organic detritus and silt get caught, and the thick slime becomes easily seen with a naked eye. If it isn’t removed, this tasty mat attracts barnacles, tube worms, mussels, or whichever sessile organisms are floating in the water at the time. When looking for anti-fouling strategies, one must consider a wide array of organisms with different life histories and seasonal growth, strength of adhesion, and settlement preferences. In addition, fouling control solutions must be effective for a sufficient period of time, must comply with air and water pollutant regulations, must be labor and cost effective, and must leave the surface undamaged. There currently are two different approaches to defeating settlement and adhesion, sometimes used in conjunction: 1) paints containing an active anti-foulant, e.g. copper ion, or a biocide, and 2) fouling-release coatings or slippery surfaces, e.g. silicones or fluoropolymers. Several alternative technologies are currently under investigation: hydrogels, surfaces with nano- or micro-topographies, superhydrophobic surfaces, biocides inspired from natural compounds, clever mechanical cleaning devices, surface properties modulated by physical triggers (e.g. heat, electricity, radiation). Thus, the development of such novel approaches requires close collaboration among engineers, biologists, chemists, and material scientists. No one solution will likely be universal, given the different sizes and speeds of vessels and platforms, sensors with specific performance needs (e.g. flexibility, optical clarity, porosity), cost and feasibility per unit surface area, and the variety of targeted fouling organisms. Environmentally acceptable and robust solutions should nevertheless have as broad a spectrum of activity as possible while remaining commercially viable. It is very important to follow all manufacturer recommendations when applying or removing a given coating to help prevent water pollution. Should you come across organotin paint leftover from another era, know that a complete worldwide prohibition of this biocide has been enacted by the International Maritiem Organization since 2008. Such product should be returned to the original vendor or a licensed waste management facility. In an effort to prevent the spread of unwanted invasive species, boaters undergoing long distance travel along the coast should pay particular attention to the hull cleanliness of their boats, espeically in nooks and crevices near the engine. For more tips, check out Sailors for the Sea's Green Boating Guide!